Product prices and availability are accurate as of 2019-03-30 21:15:34 EDT and are subject to change. Any price and availability information displayed on http://www.amazon.com/ at the time of purchase will apply to the purchase of this product. 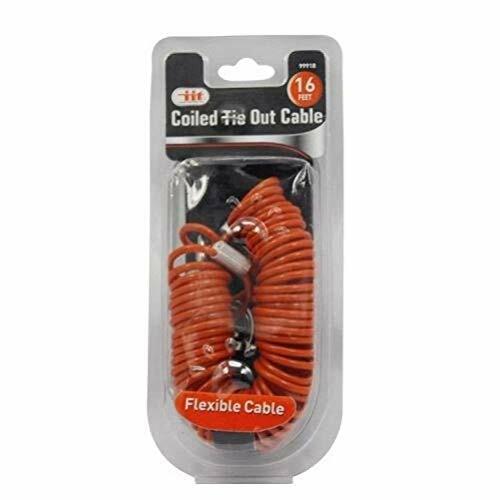 Made with dogs up to 60 lbs in mind, these 16 feet of Tie-Out cable are coiled for easy storage and to minimize tangling. It stretches out and then coils right back up. The cable has the ability to tie your best friend out and trust that he'll be there when you get back as well as avoid messes. Just clip the cable to the stake and the dog's collar. The cable is made of vinyl-coated, weather-resistant galvanized steel and is extremely durable. With a setup like this you can put this up out in the yard, forget about it, and know it'll be there the next day!